José Maurício Bustani is a Brazilian diplomat who was the first director-general of the Organisation for the Prohibition of Chemical Weapons (OPCW) until he was ousted after falling out with the US government in April 2002. He was Ambassador of Brazil to the United Kingdom between 2003 and 2008 and is currently Ambassador of Brazil to France. It was the first time in history that the head of a major international organization was removed during his/her term of office. There is much controversy surrounding the reasons behind Bustani’s removal. Bustani had been negotiating with the Iraqi government, and was hoping to persuade them to sign up to the OPCW, thus granting OPCW inspectors full access to Iraq’s purported “chemical weapons arsenal”. If Bustani had succeeded, this would have placed a formidable obstacle in the path of the Bush administration’s war plans, by removing their ostensible motive. Bustani’s supporters insist this was the reason why the US forced him out. In an extraordinary interview with RT today (7th April), Bustani (image on the right) tells of having his family threatened by none other than newly appointed U.S. National Security Advisor John Bolton back when Bolton was Under Secretary of State for Arms Control just prior to the Iraq war that led to hundreds of thousands of casualties and the destabilisation of the region. 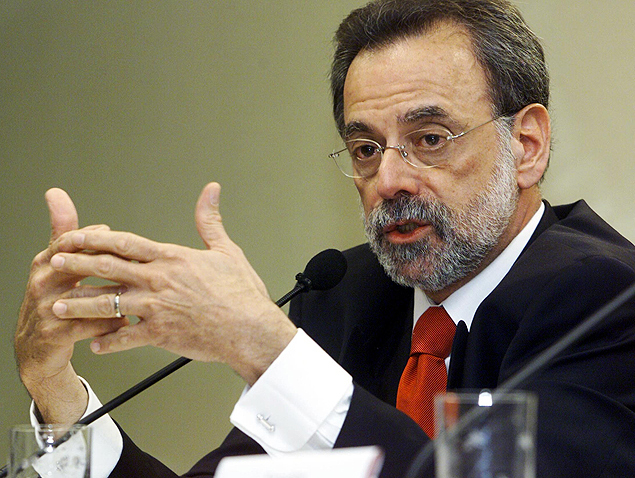 Jose Bustani was then asked by the then Under Secretary of State for Arms Control John Bolton to resign. Bustani refused. 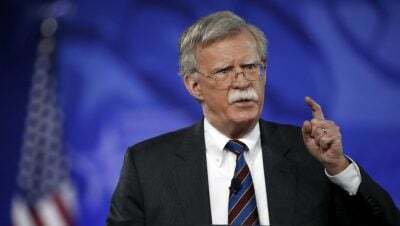 Bustani objected on the grounds that he was elected by all members states of the OPCW, not just the U.S.
Bustani alleges that Bolton physically threatened members of his family if he did not comply and immediately resign. Bustani confirmed that his two sons were in New York at the time and is clearly becoming uncomfortable recounting the story for this interview. he Combined Joint Task Force, in its monthly assessment of civilian casualties from the U.S. coalition’s operations against ISIS acknowledged at least 352 civilians had been killed in U.S.-led strikes in Iraq and Syria since the operation began in 2014. According to The Guardian, however, the Pentagon put civilian deaths in strikes on ISIS way lower than outside groups. Such a conclusion was made due to the latest data published by Airwars monitoring group. Airwars estimated that 3,164 civilians had been killed by the US-led coalition’s indiscriminate air strikes since the beginning of the ‘counter-terrorism’ operation in Syria and Iraq. Earlier, Airwars reported that only in March this year, as a result of the numerous coalition’s attacks, the number of civilian casualties increased to 1,782. According to Amnesty International, the likely civilian death toll in Syria from air strikes by Coalition forces between 23 September 2014 and August 2016 was in the range of 804 to 1,213. It was also reported that such an impressive number of victims was caused by inaccurate air strikes, erroneously carried out mainly not at the positions of terrorists, but at residential areas and civil infrastructure. In this regard, it becomes clear why the command of the international coalition deliberately hides the real number of victims in Iraq and Syria. Having officially acknowledged the deaths of such an impressive number of civilians, Washington will be forced to acknowledge the low level of training of the U.S. Armed Forces in fighting terrorism. The White House can’t allow this. Now all its efforts are directed to a show of force such as the previous strikes at the Syrian Shayrat airfield. Moreover, in order to maintain the image of a superpower, Washington is ready to neglect even the lives of helpless civilians. There is no doubt that it is difficult for Washington to hide the real number of casualties among civilians during its military operation in Syria and Iraq. To try and mitigate the reaction of the world community, the Combined Joint Task Force can only dose the ‘new information’ about the victims and demonstratively express its deepest sympathies to the families and others affected by the coalition’s air strikes. Anna Jaunger is a freelance journalist from Inside Syria Media Center. “There can be no doubt in the international community’s mind that Syria has retained chemical weapons in violation of its agreement and its statement that it had removed them all. There is no longer any doubt,” Mattis told reporters. US planes trapped the long convoys by disabling vehicles in the front, and at the rear, and then pounded the resulting traffic jams for hours. “It was like shooting fish in a barrel,” said one US pilot. The horror is still there to see. On the inland highway to Basra is mile after mile of burned, smashed, shattered vehicles of every description – tanks, armored cars, trucks, autos, fire trucks, according to the March 18, 1991, Time magazine. 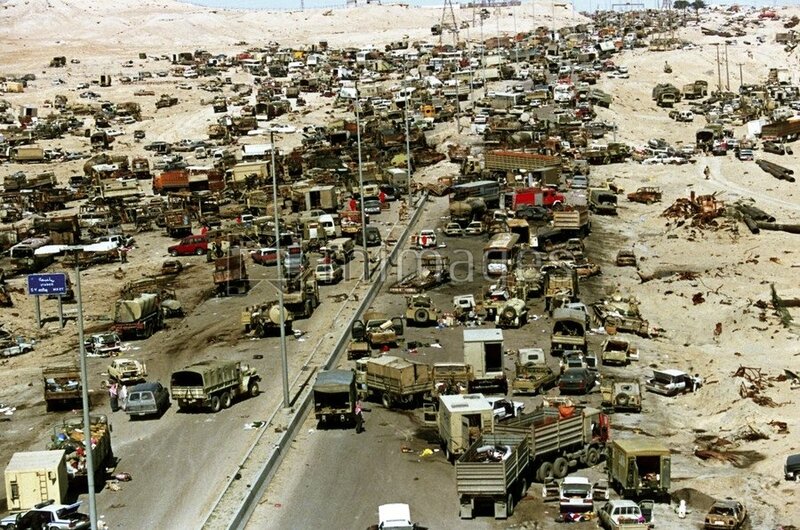 On the sixty miles of coastal highway, Iraqi military units sit in gruesome repose, scorched skeletons of vehicles and men alike, black and awful under the sun, says the Los Angeles Times of March 11, 1991. While 450 people survived the inland road bombing to surrender, this was not the case with the 60 miles of the coastal road. There for 60 miles every vehicle was strafed or bombed, every windshield is shattered, every tank is burned, every truck is riddled with shell fragments. No survivors are known or likely. The cabs of trucks were bombed so much that they were pushed into the ground, and it’s impossible to see if they contain drivers or not. Windshields were melted away, and huge tanks were reduced to shrapnel. “Even in Vietnam I didn’t see anything like this. It’s pathetic,” said Major Bob Nugent, an Army intelligence officer. This one-sided carnage, this racist mass murder of Arab people, occurred while White House spokesman Marlin Fitzwater promised that the US and its coalition partners would not attack Iraqi forces leaving Kuwait. This is surely one of the most heinous war crimes in contemporary history. Eyewitness Kuwaitis attest that the withdrawal began the afternoon of February 26, 1991 and Baghdad radio announced at 2:00 AM (local time) that morning that the government had ordered all troops to withdraw. The massacre of withdrawing Iraqi soldiers violates the Geneva Conventions of 1949, Common Article III, which outlaws the killing of soldiers who are out of combat. The point of contention involves the Bush administration’s claim that the Iraqi troops were retreating to regroup and fight again. Such a claim is the only way that the massacre which occurred could be considered legal under international law. But in fact the claim is false and obviously so. The troops were withdrawing and removing themselves from combat under direct orders from Baghdad that the war was over and that Iraq had quit and would fully comply with UN resolutions. To attack the soldiers returning home under these circumstances is a war crime. Air strikes against Iraqi troops retreating from Kuwait were being launched so feverishly from this carrier today that pilots said they took whatever bombs happened to be closest to the flight deck. The crews, working to the strains of the Lone Ranger theme, often passed up the projectile of choice . . . because it took too long to load. New York Times reporter Maureen Dowd wrote, “With the Iraqi leader facing military defeat, Mr. Bush decided that he would rather gamble on a violent and potentially unpopular ground war than risk the alternative: an imperfect settlement hammered out by the Soviets and Iraqis that world opinion might accept as tolerable.” In short, rather than accept the offer of Iraq to surrender and leave the field of battle, Bush and the US military strategists decided simply to kill as many Iraqis as they possibly could while the chance lasted. A Newsweek article on Norman Schwarzkopt, titled “A Soldier of Conscience” (March 11,1991), remarked that before the ground war the general was only worried about “How long the world would stand by and watch the United States pound the living hell out of Iraq without saying, ‘Wait a minute – enough is enough.’ He [Schwarzkopf] itched to send ground troops to finish the job.” The pretext for massive extermination of Iraqi soldiers was the desire of the US to destroy Iraqi equipment. But in reality the plan was to prevent Iraqi soldiers from retreating at all. Powell remarked even before the start of the war that Iraqi soldiers knew that they had been sent to Kuwait to die. Rick Atkinson of the Washington Post reasoned that “the noose has been tightened” around Iraqi forces so effectively that “escape is impossible” (February 27, 1991). What all of this amounts to is not a war but a massacre. There are also indications that some of those bombed during the withdrawal were Palestinians and Iraqi civilians. According to Time magazine of March 18, 1991, not just military vehicles, but cars, buses and trucks were also hit. In many cases, cars were loaded with Palestinian families and all their possessions. US press accounts tried to make the discovery of burned and bombed household goods appear as if Iraqi troops were even at this late moment looting Kuwait. Attacks on civilians are specifically prohibited by the Geneva Accords and the 1977 Conventions. How did it really happen? On February 26, 1991 Iraq had announced it was complying with the Soviet proposal, and its troops would withdraw from Kuwait. According to Kuwaiti eyewitnesses, quoted in the March 11, 1991 Washington Post, the withdrawal began on the two highways, and was in full swing by evening. Near midnight, the first US bombing started. Hundreds of Iraqis jumped from their cars and their trucks, looking for shelter. US pilots took whatever bombs happened to be close to the flight deck, from cluster bombs to 500 pound bombs. Can you imagine that on a car or truck? US forces continued to drop bombs on the convoys until all humans were killed. So many jets swarmed over the inland road that it created an aerial traffic jam, and combat air controllers feared midair collisions. The victims were not offering resistance. They weren’t being driven back in fierce battle, or trying to regroup to join another battle. They were just sitting ducks, according to Commander Frank Swiggert, the Ranger Bomb Squadron leader. According to an article in the March 11, 1991 Washington Post, headlined “US Scrambles to Shape View of Highway of Death,” the US government then conspired and in fact did all it could to hide this war crime from the people of this country and the world. What the US government did became the focus of the public relations campaign managed by the US Central Command in Riyad, according to that same issue of the Washington Post. The typical line has been that the convoys were engaged in “classic tank battles,” as if to suggest that Iraqi troops tried to fight back or even had a chance of fighting back. The truth is that it was simply a one-sided massacre of tens of thousands of people who had no ability to fight back or defend themselves. The Washington Post says that senior officers with the US Central Command in Riyad became worried that what they saw was a growing public perception that Iraqi forces were leaving Kuwait voluntarily, and that the US pilots were bombing them mercilessly, which was the truth. So the US government, says the Post, played down the evidence that Iraqi troops were actually leaving Kuwait. US field commanders gave the media a carefully drawn and inaccurate picture of the fast-changing events. The idea was to portray Iraq’s claimed withdrawal as a fighting retreat made necessary by heavy allied military pressure. Remember when Bush came to the Rose Garden and said that he would not accept Saddam Hussein’s withdrawal? That was part of it, too, and Bush was involved in this cover up. Bush’s statement was followed quickly by a televised military briefing from Saudi Arabia to explain that Iraqi forces were not withdrawing but were being pushed from the battlefield. In fact, tens of thousands of Iraqi soldiers around Kuwait had begun to pull away more than thirty-six hours before allied forces reached the capital, Kuwait City. They did not move under any immediate pressure from allied tanks and infantry, which were still miles from Kuwait City. This deliberate campaign of disinformation regarding this military action and the war crime that it really was, this manipulation of press briefings to deceive the public and keep the massacre from the world is also a violation of the First Amendment of the US Constitution, the right of the people to know. Joyce Chediac is a Lebanese-American journalist who has traveled in the Middle East and writes on Middle East issues. Her report was presented at the New York Commission hearing, May 11, 1991. Commander of Asa’eb al-Haq Movement affiliated to the Iraqi popular forces of Hashd al-Shaabi said that the US forces have carried out a rapid heliborne operation and evacuated two commanders of ISIL terrorists from Western Mosul in Northern Iraq. Javad al-Talaybawi said that the US forces carried out the heliborne operation in one of the Western neighborhoods of Western Mosul, evacuating two senior ISIL commanders to an unknown location after the commanders came under siege by Iraqi government forces in intensified clashes in Western Mosul. “Americans’ support and assistance to the ISIL is done openly to save their regional plan in a desperate attempt,” al-Talaybawi underlined. Al-Talaybawi had warned late in February that the US forces tried hard to evacuate ISIL commanders from the besieged city of Tal Afar West of Mosul. After photos surfaced in the media displaying US forces assisting ISIL terrorists, al-Talaybawi said that the Americans were planning to take ISIL commanders away from Tal Afar that is under the Iraqi forces’ siege. In the meantime, member of Iraqi Parliament’s Security and Defense Commission Iskandar Watut called for a probe into photos and footages displaying US planes airdropping aid packages over ISIL-held regions. Watut further added that we witnessed several times that US planes dropped packages of food stuff, arms and other necessary items over ISIL-held regions, and called on Iraq’s air defense to watch out the US-led coalition planes. Eyewitnesses disclosed at the time that the US military planes helped the ISIL terrorists in Tal Afar region West of Mosul. “We saw several packages dropped out of a US army aircraft in the surrounding areas of the city of Tal Afar in Western Nineveh province and six people also came out of a US plane in the ISIL-controlled areas,” the Arabic-language media quoted a number of eyewitnesses as saying.